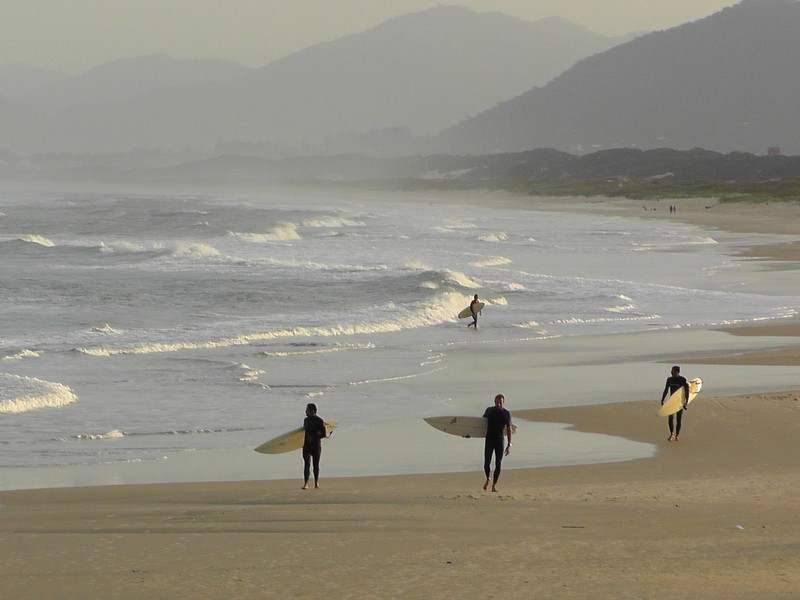 Joaquina, my new favorite beach | Surfer Grrrls Brazil! 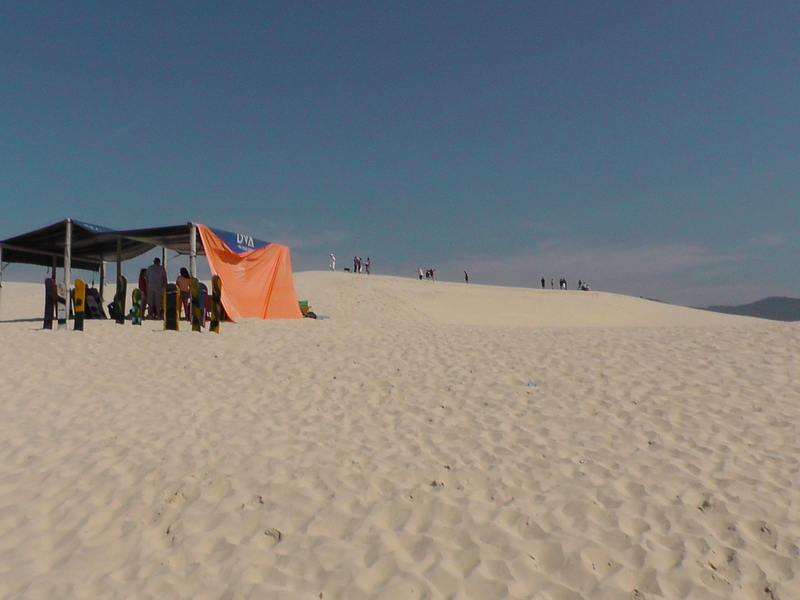 The dunes on the way to Joaquina. You can rent a “sandboard” at the tent. championships. 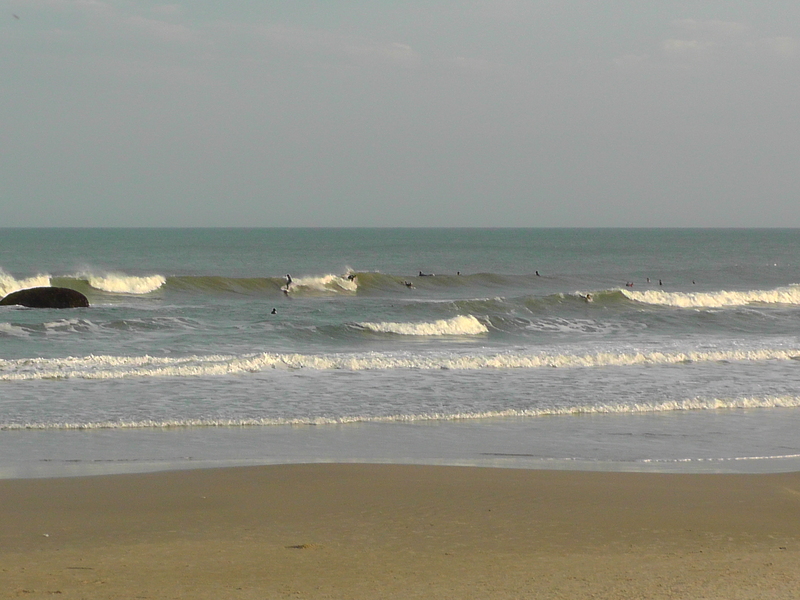 If you come at the right time, you can see some CRAZY good surfers shredding it on the outside set. Behind the beach is a trippy landscape of sand dune mountains and coastal forest. On the narrow road that winds through the hills and dunes to Joaquina, you can see crowds of people “sand boarding” – which is basically snow boarding down the dunes. I’ve heard that this sport was invented on the dunes of Floripa, which does not surprise me, given the overall love for sports and the outdoors that I have encountered here. College Surf School, meeting point for grommets and seasoned surfers alike, all under the auspices of jedi master, Fabricio Machado. On my first trip here, after a bus odyssey that seemed to circumnavigate the entire Island, I arrived at the beach at 5 pm. This was just when the only surf school open that day (or during the whole winter season for that matter) was about to close. The owner, Fabric, a local surf legend, took pity on me and hung around an extra 45 minutes so I could rent a board and catch a few waves. That evening, I hitched a ride home with another surfer and discovered that the beach was only 20 minutes from my house, rather than 2 hours, as my bus ride suggested. Cool. Typical saturday at Joaqina. Lots of families come to spend the day. videographer with no car and a house far from the beach, I have a lot of logisitical hurdles to overcome on a daily basis – like dragging my board on and off crowded buses, dragging a wetsuit and a bunch of video equipment to the beach every day, finding a place to stash it while i am surfing, and taking it all home (soaked wetsuit and videocamera in the same bag). 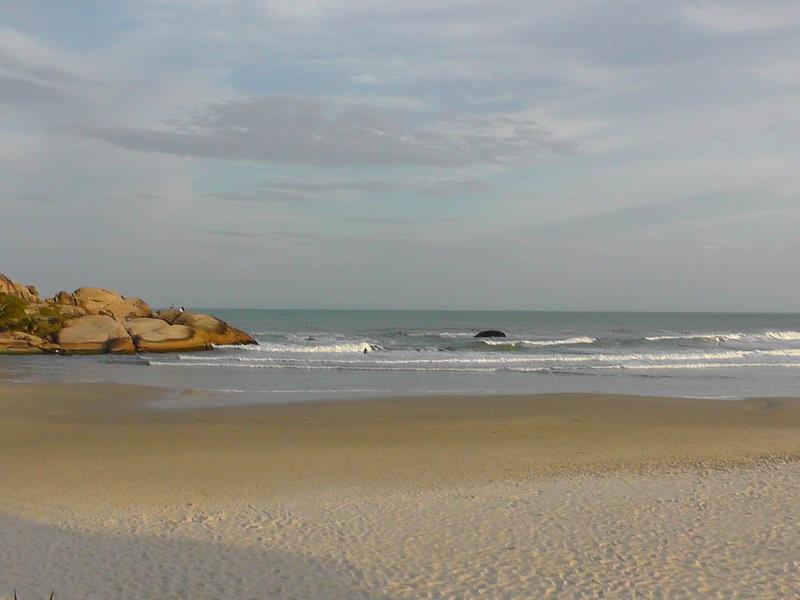 The nice folks of the Joaquina surf community have helped me solve a lot of these little challenges. personal trainer, a local graffiti artist, a surf photographer/capoeirista, a guy named after the Greek philosopher Themistocles). And recently, in a major breakthrough in life options, a kindly old-timer surf shop owner down the road has let me store my board at his place so I don’t have to haul it on the bus every day, prompting the ire of my fellow passengers who get bumped, tripped, displaced, or boxed in by the 6 foot 9 inch fiberglass behemoth I force upon them. Marcia and Fatima – devotees of Joaca. Marcia is a mom and Fatima a personal trainer, and both of them are out in the water just about every day. 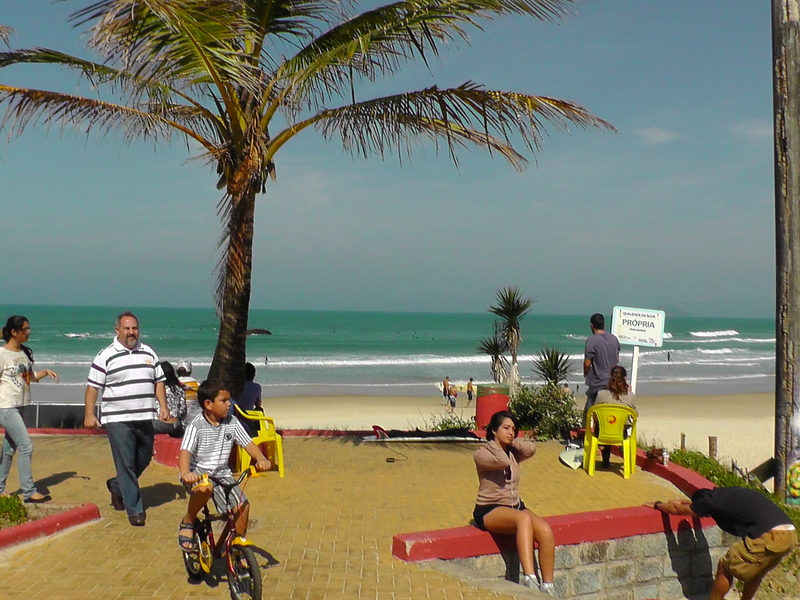 I’ve had lots of firsts so far in just a short time at Joaquina. I caught by far the longest wave of my life last week. I got it right on the shoulder, and just kept going for ever and ever. I couldn’t believe it. I was so excited, I forgot to do any of the other things I’ve been trying to work on (like turns!) and just froze like a dummy with a big fat grin on my face, literally squealing as I rode the wave into sunset. I think I was still smiling when I went to sleep. Next step: learning how to carve. But oh it is a long road. Hopefully the good juju of Joaquina will stay with me as I learn. And while I am still living in a world with no video or music editing capabilities, here’s a quick clip of my friend Clara catching a wave on her body board. We met when I was eating dinner at a restaurant where she works. 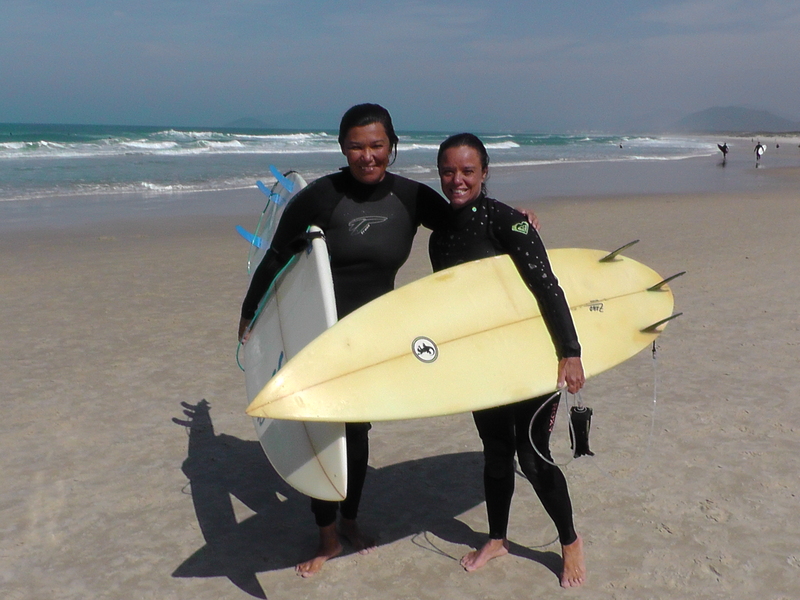 She is a mom and a former body board champ who lives by Joaquina and surfs every day! Wow! Sounds awesome!!!! And thosr pictured make me neef to go to there.